The Late Bronze Age archaeology at Must Farm is an incredible collection of well-preserved artefacts and remnants of the occupation of the site, from structural timbers to the footprints preserved in the sediment surrounding the settlement. 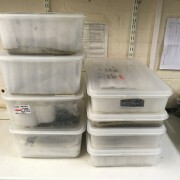 The site’s preservation conditions also ensured that valuable environmental data was saved allowing us to take extensive samples for further study. During the 2015-16 excavations we collected an enormous amount of material, samples and information. 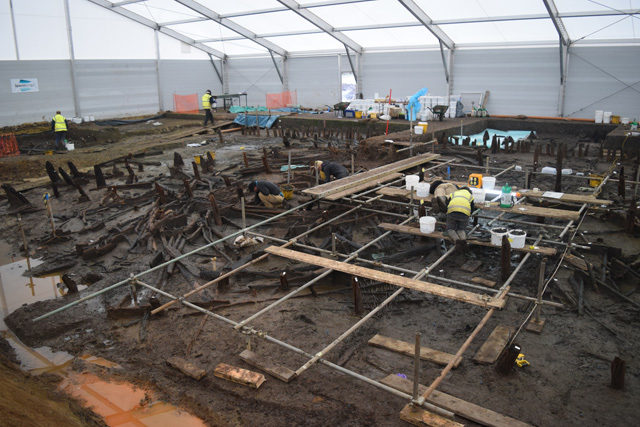 The post-excavation work we are currently carrying out is focused on understanding all the different strands of the Must Farm settlement, ranging from the environment surrounding the site to the activities taking place inside and around its structures. 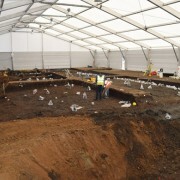 To achieve this the post-excavation incorporates a wide range of different scientific and investigative techniques across material and evidence types, with experts from across the UK. Following the completion of the dig in August 2016 much of our initial work was focused on collating all our evidence and formatting the gathered information ready for analysis to begin in earnest (discussed in Post-Ex Diary 2: What is Post-Excavation?). Assessments and interim analyses were performed during 2017 (Post-Ex Diary 4: 2017 – Interim Analysis) to better guide the rest of the post-excavation process which is now well underway. In these diary entries we’ll detail the range of specialist work being undertaken and how each is contributing to the overall understanding of Must Farm: its construction, occupation, destruction, surroundings and much more. The excavation of the Must Farm settlement was the first stage in understanding the activity at the site. To move closer to a complete picture of the settlement’s history, specialist analysis and investigation is essential. Currently, almost 50 specialists are working on investigating 37 different aspects of Must Farm focusing on its material, environmental samples and dating the site scientifically. Their work ranges from researching microscopic remains such as parasite eggs to examining 3-metre-long structural timbers. Similarly, specialists can be investigating a handful of artefacts or samples whereas others are studying hundreds of different ones. It is during this combination of wide-ranging specialist investigation that theories and interpretations developed during the excavation can be tested or expanded. For example, if we suspect the Must Farm settlement was short-lived, can we see evidence for this in the microscopic formation of sediments in the river channel? If people at Must Farm are living directly over a river channel, what impact does this have on the quality of the water and the health of the animals living within it? 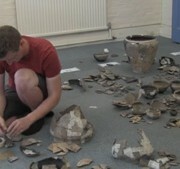 Can we determine the contents of the pots found during the excavation? What were different vessel types used for? With such a variety of different techniques being used by specialists there are thousands of questions to be asked, all of which are designed to move towards a more comprehensive understanding of the Must Farm site. Through these questions subtle aspects of the archaeology can be teased out combining the evidence gathered on-site during the excavation with these more recent, off-site investigations. A further crucial element of the specialist analyses is that they are complementary, with the evidence gathered from one set of studies informing or expanding other work. There is often a degree of overlap between categories that can help shed light on the Must Farm before, during and after its occupation. 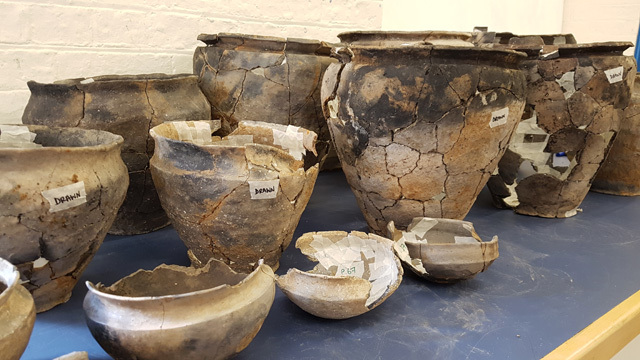 Our work refitting the pottery from the site has helped inform other areas of specialist work such as selecting vessels for organic residue analysis. 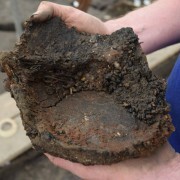 For example, our recent work refitting Must Farm’s pottery (see Post-Ex Diary 7: The Must Farm Pottery Refit) allowed us to explore the different vessel types from the settlement and where they were recovered from during the excavation. This work gave us a clear overview of the ceramics including their sizes, forms and potential spatial variations from across the site. Using the evidence derived from the refit is allowing us to target other forms of investigation such as organic residue and food crust analyses. The use of vessels (including the wear and tear, repair and breakage) also has important implications for our understanding of the short time span of the settlement. Similarly, many of the specialists’ work provides information on different aspects of the site and its lifespan. While animal bone is material culture from the site, providing insight into diet for butchered or processed examples it also gives us information on the environment surrounding the settlement. 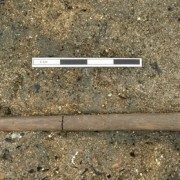 Additionally, signs of charring on bone may be able to indicate its position at the time of the fire that destroyed the settlement and provide additional insight into the conditions of the blaze itself. Most of the scientific analyses are still ongoing and with 37 different categories of investigation it isn’t possible to provide detailed updates on all their progress. 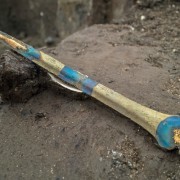 However, we are keen to share the work that is being undertaken and to emphasise just how important (and complex) post-excavation in archaeology is. 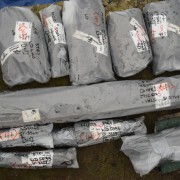 During the excavation we extensively sampled the settlement’s deposits. 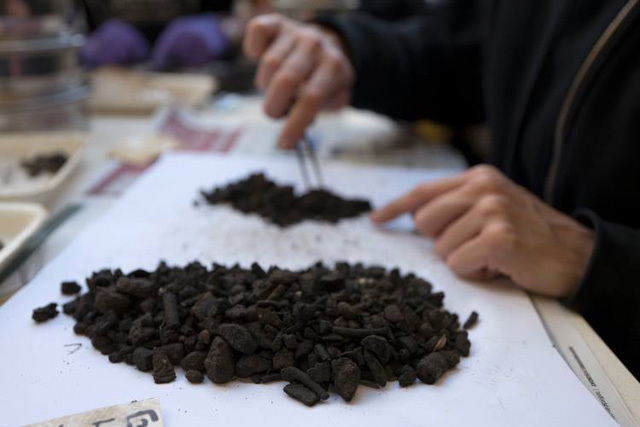 These samples were then carefully sorted to recover plant remains, charcoal and wood fragments for further analysis. These areas of analysis are focusing on studying material mostly collected from environmental samples taken across the excavation area. Plant macrofossils are preserved organic remains including seeds, fruits and other vegetative remains (including mosses, grasses and fungi) and are typically studied using a microscope to identify species. This work is extremely valuable for understanding the environment of the Must Farm settlement and seeing what plant material was present during the occupation of the site. Examining the quantities of macrofossils present across the site and searching for differences below and surrounding the structures is just one area being explored. Owing to the fire that destroyed the settlement environmental samples from the site contain large quantities of charcoal and wood fragments. Studying these has allowed us to find small fragments from wooden artefacts alongside identifying differences in the density of charcoal from the site’s various depositional layers. The remains of smaller vertebrates are essential for building a complete picture of the settlement and its environment. 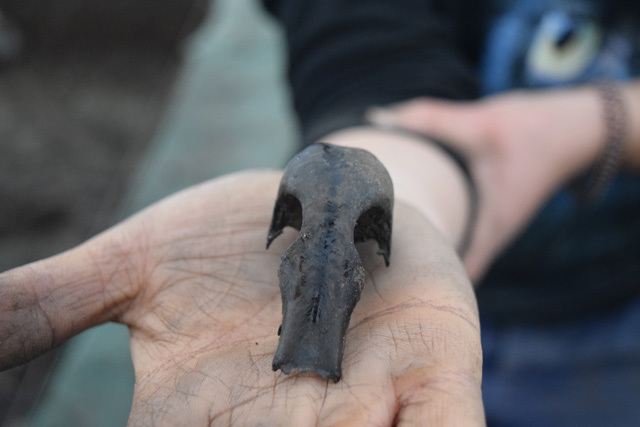 These remains include fish, amphibians, small mammals and birds such as this duck skull. Alongside the larger faunal remains of pigs, sheep and deer smaller animals are equally important at understanding both the river channel and the Must Farm settlement. 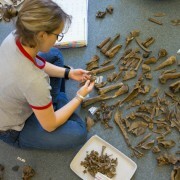 These vertebrate remains include fish, birds, amphibians and small mammals and one of the main areas of specialist work is trying to separate the bones associated with the occupation of the site with the natural history of the river channel it was built above. Any body of water will have a natural death population of small vertebrates associated with it and separating out this “background noise” from the remains potentially tied to the human habitation of the site is a tricky task. The tiny size of fish, bird and small mammal bones adds to the complexity with many of the remains recovered from the environmental samples sorted during the early stages of post-excavation. Initial work has been studying the fish remains and potential patterning of their deposition surrounding the stilted structures. Caches of pike mandibles have been identified suggesting they were being exploited to some degree by the site’s inhabitants. Work on the small vertebrates is still taking place and is has important overlaps with the faunal analysis of the larger animal remains from the site. Understanding the formation processes of sediments present at an archaeological site is an essential form of analysis and vital for understanding the different layers at the Must Farm settlement. 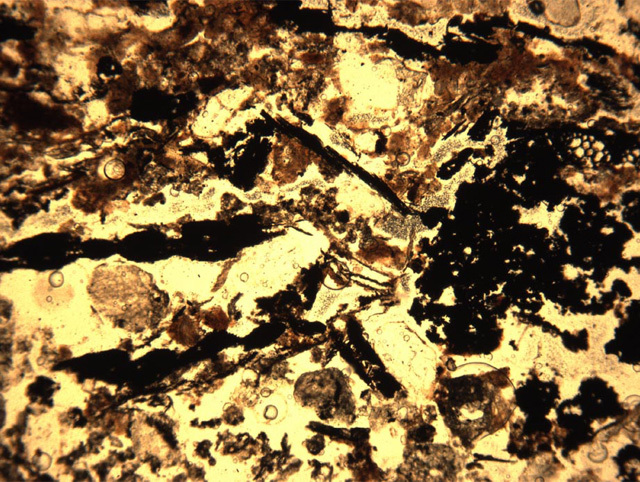 This beautiful photomicrograph is a sample from the occupation deposits at the site showing a mixture of wood charcoal, charred plant fragments, very fine quartz sand and micrite and micritic ash “dust”. Micromorphology, studying a site’s sediments using microscopy to better understand their origins and the different formation processes they may have been subjected to, is a highly important aspect of archaeological investigations. During the excavation we described some of our preliminary investigations using this technique (see Dig Diary 34: Examining our Clay and Turf Material) and its value at aiding the development of interpretations. During this stage of the post-excavation archaeological micromorphology is helping us to better understand the different layers present at the site. These different deposits are key to unpicking the lifespan of the settlement, looking at the sediments that were formed before, during and after its occupation. Throughout the excavation many of the strands of evidence we were encountering suggested that the stilted structures were short-lived before the fire that destroyed them. The layering of the sediments seems to support this concept of a restricted lifespan. The surfaces that have been identified are few and relatively pristine. The occupation deposits appear to show the settlement was in use for a limited time, perhaps only months or a year, before experiencing a catastrophic blaze. Work is still ongoing into the formation history of the deposits tied to the site but is already helping improve and tighten our interpretations. Molluscs are an important indicator of environmental conditions. The river channel below the structures contained a large quantity of mussels. Were they being used as a food source? Molluscs, typically snails, have proven particularly useful for archaeologists, allowing them to understand past environmental conditions. Molluscs favour certain habitats and identifying species (often by examining snail shells that are durable and tend to survive in the archaeological record) can indicate what environment a past site would have existed in. At Must Farm molluscs are an important component for understanding its environment, particularly the mussels present in the river channel. 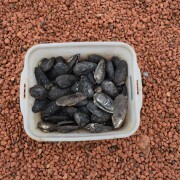 Mussels are a good indicator of the health of a river and its water conditions alongside providing information on the layering that occurs within a channel. We are fortunate at Must Farm as we have distinct stratigraphy within the river. 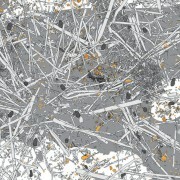 There is a highly recognisable shelly deposit that acts as a “baseline” upon which later activity at the site takes place creating new, identifiable layers. 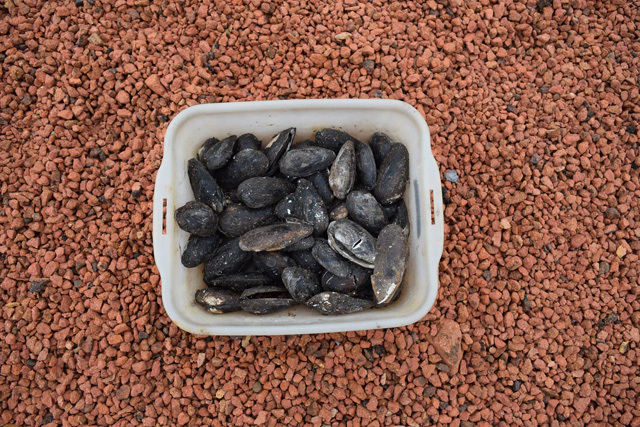 Molluscs can also be a handy source of food and we are currently looking at the quantities to try and determine if mussels were being consumed by the people at the settlement. In a similar challenge to the small vertebrates mentioned above, it is necessary to try and determine the “natural” levels of mussels within the challenge alongside exploring distributions to try and work out if these molluscs were being used as a food source. Our discussion of specialist analyses will continue in our next two Post-Ex Diary entries.